Federal Highway Administration's (FHWA)'s Highway Safety Improvement Program (HSIP) Peer-to-Peer Program (P2P) supports and sponsors peer exchanges and workshops hosted by agencies. FHWA's Office of Safety sponsors HSIP P2P events. This report provides a summary of a peer exchange sponsored by the Association of New York State Metropolitan Planning Organizations (NYSMPOs) and the New York State Department of Transportation (NYSDOT). It also includes proposed next steps developed as part of the NYSMPO Safety Working Group's (SWG) action plan. The peer event coincided with the 2010 NYSMPO Annual Conference. The peer exchange convened New York's safety stakeholders to identify ways to collaborate with NYSDOT to improve safety on all of the State's roadways with the desired outcome to develop strategies for an action plan to help New York's metropolitan planning organizations (MPOs) work with partners to progress safety issues and reduce fatal and serious injury crashes in New York. The action plan will provide a foundation for NYSMPO's Comprehensive Safety Monitoring and Planning effort, which seeks to address safety issues on local roads in New York's Highway Safety Improvement Program (HSIP).The event also focused on sharing knowledge among selected peers on active participation in the HSIP, including the Mid-Ohio Regional Planning Commission (MORPC), Delaware Valley Regional Planning Commission (DVRPC), and the Louisiana Department of Transportation and Development (LA DOTD). Criteria for selecting peers included demonstration of successful past collaboration with safety partners, including State DOTs, MPOs, law enforcement, local governments, public health providers, and educators in developing and implementing local HSIP projects in rural and urban locations. Success with systematic improvements was another criterion: these types of projects can effectively address the types of crashes, such as roadway departures, which occur on local roads. The action plan developed from the peer exchange will ultimately identify champions as well as a timeline for deliverables. Participation of NYSDOT regional and headquarters' staff is paramount to the success of any proposed strategy. The SWG will be expected to continuously monitor the action plan's performance and recommend changes, as needed. NYSMPO formed the SWG in 2005 to “advance initiatives intended to preserve, maintain, and improve traffic safety for all users in New York State.” NYSMPO members include representatives from all thirteen of New York's MPOs, as well as the Federal Highway Administration's (FHWA) New York Division Office, the Governor's Traffic Safety Committee (GTSC), NYSDOT, and the New York State (NYS) Police. NYSMPO's SWG works to increase each NYSMPO's involvement in safety planning and encourages the addition of safety-related tasks and projects to MPOs' work plans. Engaging and involving NYSMPOs in safety planning will assist NYSDOT in addressing non-state roadways, a need identified by both NYSDOT and NYSMPOs. Coordinating with the National Highway Traffic Safety Administration, the NYS Association of Traffic Safety Boards, and the public health community to address the human behavior side of crashes. The SWG also initiated the Comprehensive Safety Monitoring and Planning effort to identify activities for NYSMPO's subcommittees and safety partners. The effort's primary goal is to address safety issues on local roads in New York's HSIP. Currently, HSIP funds have been challenging to use for projects off the State roadway system. Recommended next steps to involve MPOs in the HSIP process to improve safety and reduce traffic fatalities on New York's local roads. Twenty-six professionals representing three of the “E's” (engineering, enforcement, and education) attended the workshop, including representatives from eleven of New York's MPOs, NYSDOT, GTSC, and the Syracuse Police Department (see Appendix A for a complete list of event planners and presenters). The peer exchange included a brief overview of current trends, safety programs, and practices, followed by a panel discussion on the state of the practice for the NYS HSIP (see Appendix B for the agenda). Each peer agency described approaches and techniques used to successfully implement local HSIP projects. Following the peer presentations, breakout groups identified strategies and next steps to improve New York's local HSIP process, with the goal to create groups to provide different perspectives on integrating MPOs into the HSIP implementation process. Engage State DOT safety staff as champions — Key individuals from the SWG, including NYSDOT representatives, initiated the peer exchange and remain engaged as champions for implementing actions to meet its goals. Involvement of NYSDOT safety staff was important to ensure that proposed actions are implemented in cooperation with the State. Select and invite peers — Event organizers identified and invited three peer agencies (MORPC, DVRPC, and LA DOTD) that have demonstrated success in integrating MPOs into the local HSIP process. Selecting peers that effectively addressed the host agency's program gaps was critical to developing a successful NYS HSIP peer exchange. Recruit participants — Safety specialists from all of New York's MPOs were encouraged to attend the event as well as NYSDOT regional offices, headquarters staff, and staff from local agencies (GTSC, law enforcement, and public health organizations). Convening this group provided an opportunity for New York's safety specialists to network and learn from one another, and was critical to assisting NYSMPOs and other local agencies in understanding their role in the HSIP local project selection and implementation process. Collect and distribute background information — Participants received background materials related to New York's HSIP including the 2010 SHSP and the SWG's Safety Monitoring and Planning Task list, as well as links to NYSMPO's Safety Assessment Quick Reference Document, the Safety Assessment Brochure, and Safety Assessment Guidelines, one week prior to the event. Pre-event preparation allowed attendees more time to understand the HSIP process during the event. Host the peer event — FHWA Office of Safety staff and the New York planning team created an agenda for the peer exchange that addressed New York's needs. The agenda was designed to provide New York with an opportunity to learn about peer States' experiences and to identify opportunities to improve NYS processes through an open exchange of ideas and knowledge. Discussion worksheets were designed for the workshop portion of the event. These workshops provided a simple way to capture feedback on developing the SWG's action plan. Jay Schissell, Director of the Elmira-Chemung Transportation Council and former chair of the NYSMPO SWG, welcomed participants to the peer exchange and acknowledged peer presenters and FHWA staff. Schissell's remarks highlighted New York MPOs' commitment to safety and their role in making New York's local roadways safer. Schissell noted that MPOs are in the best position to form relationships with local agencies that can progress traffic safety. To set the framework for the event, Sandra Misiewicz, Senior Transportation Planner for the Capital District Transportation Committee MPO and chair of the NYSMPO SWG, outlined the purpose of the workshop and expected outputs. Misiewicz emphasized the workshop's goal to create an action plan to guide and better involve New York's MPOs in working with safety partners to improve safety issues and to reduce fatalities and serious crash-related injuries in the State. NYSDOT's Office of Modal Safety and Security provided background on New York's traffic safety programs. Historically, the GTSC had developed the highway safety plan for the State. However, in 2005, the Safe, Accountable, Flexible, Efficient Transportation Equity Act: A Legacy for Users introduced a requirement for NYSDOT to adopt a SHSP. To develop the SHSP, NYSDOT used data housed by the New York Department of Motor Vehicles to build on GTSC's plan. Action plans for emphasis areas outside of GTSC's plan were never formally created. The SHSP was recently updated and NYSDOT is working to formalize how safety is incorporated into the planning process. The crash data system in New York was also discussed during this presentation. Currently, NYS has complete data on the State road system as well as on some New York City locations. Work is continuing to develop a traffic records network to include all public roads. Evaluating countermeasures for the local system. Addressing these needs is essential for MPOs to develop a consistent approach to identify and prioritize local HSIP projects. FHWA New York Division Office described its role in overseeing safety programs for New York, including High Risk Rural Roads, Safe Routes to School, and HSIP. The Division Office discussed some of the major safety challenges in New York, such as matching the right funding source to the right project. An additional challenge is obtaining accurate and timely data to ensure a data-driven approach for HSIP projects. Few data exist for rural roads, making it difficult to address safety issues through the High Risk Rural Roads Program. Finally, it can be difficult to fund local road projects but the Division Office is flexible and looks forward to identifying creative strategies to do so. FHWA Office of Safety (HSA) provided an overview of HSA’s role. HSA focuses on developing guidance to help agencies, including MPOs and counties, to more effectively implement safety improvements. Improvements do not have to be large or complex. When developing a safety program, States can incorporate elements from other States and peers. Following the panel presentations, participants engaged panel members in a discussion on the NYS HSIP state of the practice, focusing on the challenges and opportunities for improving safety on local roads. Participants identified limited accessibility to crash data as a major challenge to developing local road projects. The group also discussed the most effective role for MPOs in working with NYSDOT to streamline safety projects. An additional topic was the SWG's efforts to create guidance for a comprehensive safety planning approach for MPOs. Finally, FHWA discussed its efforts to encourage States to analyze data to identify systemic safety problems that might be addressed by systemic improvements. A systemic approach allows for a more comprehensive look at the potential for crashes on all non-State roadways. Identify a consistent process for applying local crash data, particularly regarding use of traffic counts and Accident Location Information system data to identify priority locations. Prior to the event, the SWG chair contacted invitees to request input on the information they expected to learn from out-of-state peers. This feedback was compiled into questions, which were then distributed to the peer speakers. Peer presentation topics covered a wide range of issues, including recommended approaches and techniques used to successfully implement HSIP projects, crash data tools, bicycle and pedestrian safety, and road safety audits (safety assessments in New York). The three peer agencies participating in the event tailored their discussions to respond to the questions received from event invitees. The following section provides an overview of the presentations. Create a Local Road Safety Program (LRSP). In Louisiana, 25 percent of all safety funds are targeted for local road safety projects. LA DOTD developed the LRSP to provide roadway safety-related funding, training, data, and technical assistance to the State's MPOs. The Louisiana Local Technical Assistance Program (LTAP) administers the LRSP in cooperation with LA DOTD. LRSP trainings focus on work zone safety, road safety assessments, and road safety program management. The LRSP offers a structured approach that has enabled LA DOTD to reach out to local partners. Share data with MPOs and local jurisdictions. LA DOTD allows MPOs and local agencies to access its internal crash query program. Program users can download a variety of data, including reports on high-crash locations throughout the State. Databases for each region are available for MPOs. Users can query and analyze data and produce Geographic Information Systems (GIS) maps. Technical assistance is provided to agencies requiring help in analyzing the data. Promote marketing and communications. LA DOTD staff work to deliver a safety message to local organizations. Presentations on the SHSP and the safety program have been provided to a number of local groups across the State, including Houma Safe Communities, Baton Rouge Safety Summit, St. Martin Parish Safe Communities, and the New Orleans Regional Safety Coalition. Establish regional safety coalitions to engage safety stakeholders. Louisiana is currently updating its SHSP. As part of the update, LA DOTD will form regional safety coalitions to develop safety plans that link to the SHSP emphasis areas. These coalitions correspond to LA DOTD districts and the Louisiana State Police (LSP) Troop Commands; they also include MPO representatives. The MPO will lead some of the coalitions, while others will be led by the Safety Council, LA DOTD District, LSP Command, local law enforcement, or by ThinkFirst National Injury Prevention Foundation. MPO involvement will be important for the coalitions to ensure that the results of plans are funded through the Transportation Improvement Program (TIP). Provide technical assistance. LA DOTD provides hands-on technical assistance to local agencies with an on-staff Law Enforcement Expert (LEE). The LEE travels around the State working with jurisdictional law enforcement agencies to encourage their participation in the road safety audit process. In addition, the LEE provides training to address issues including work zone safety, data quality issues, and incorrect and missing information in crash reports. Most helpful are the LEE's efforts in identifying opportunities for collaboration among MPOs, local transportation agencies, and law enforcement. Finally, the LEE assists with establishing Regional Safety Coalitions and serves on both Regional Incident Management Teams and the Traffic Records Coordinating Committee. Improve accuracy of crash data. Ohio safety partners work collaboratively to ensure a high level of complete and accurate crash data. Through the Crash Data Education Project, MORPC provides a training video to law enforcement and promotes ODPS' efforts to provide global positioning system units and laptops to agencies that need them. The educational video focuses on the communication challenges that previously existed between Ohio's law enforcement officers and planners/engineers, as well as the steps they have taken to overcome these challenges. The video was created as a shared effort among MORPC, ODOT, ODPS, and local agencies, and stresses the importance of accurate crash reporting for effective safety planning. In addition, MORPC hired a consultant to help correct crash data for its transportation planning area. Share crash data. Crash data and other safety-related resources are shared through a SharePoint website called Crash Point. Use State DOT tools and work to ensure high data quality. MORPC uses web tools provided by ODOT such as the GIS Crash Analysis Tool, a web-based GIS program, to review crash trends and patterns for specific projects. ODOT also created a Rate of Return analysis tool for safety projects, which is shared with MPO partners. MORPC, using the crash data as corrected by its consultant, also identifies the top-40 annual high-crash locations, as well as pedestrian and bicycle high-crash locations and corridors for the region and each city. These data help support safety project planning at MORPC and local governments. Build education and awareness. MORPC promotes safety education through webinars and forums as well as its website. For example, the MORPC website includes information on distracted driving and the “Click It or Ticket” campaign. Addressing high-risk travel behaviors and special populations is another MORPC goal. The agency works closely with Public Safety and community groups to address the human side of crashes. Examples of this work include seatbelt campaigns and cell phone legislation. Support multi-agency collaboration. MORPC participates in numerous safety committees with partner agencies and represents Ohio's MPOs on the statewide safety plan and the Traffic Records Coordinating Committee. MORPC also supports multi-agency and multi-jurisdictional safety efforts, including Safe Routes to School forums and road safety audits. Assist local governments in obtaining HSIP funds. MORPC develops annual regional high-crash location lists to identify projects likely to be eligible for HSIP funds. MORPC's website includes a section on “Funding Sources for Roadway Safety Projects,” which provides an overview of funding opportunities for local roadway safety projects and includes contact information. Encourage non-motorized travel. MORPC advocates for initiatives such as the Complete Streets Policy, RideSolutions, and Advanced Traveler Information Systems to encourage biking, walking, and public transit use, which may lead to safer overall travel. In partnership with the City of Columbus and a local bicycle advocacy group, MORPC developed a Bike User Map to encourage use of other modes and provide safety education. Coordinate analysis with State DOT. DVRPC uses crash data analysis tools available from the Pennsylvania and New Jersey State DOTs for data analysis that form the basis for safety project selection. NJDOT's Plan4Safety is a comprehensive crash data tool that includes a countermeasure generator and a predictive modeling resource for data-driven safety decisions. It is available online as is all their data. PennDOT's Crash Data Analysis and Retrieval Tool (CDART) allows users to query data into maps and reports. In addition, DVRPC maintains a robust Access interface to query the crash database and uses the crash data in GIS. DVRPC uses these tools for comprehensive transportation planning projects. Analysis results are frequently exchanged between the DOTs and MPO. Obtain funding for local projects. Staff work with State DOTs to allocate HSIP funds directly to DVRPC to implement safety projects. In New Jersey, NJDOT's Local-Federal Aid Safety Program (LFSP) allocates funds for use on non-State-owned roads. A subset of the LFSP in New Jersey is the High Risk Rural Roads Program. Both programs require locals to follow the Federal funding process and provide a demonstrated crash history. PennDOT has similar programs to allocate safety funds to projects through the DVRPC TIP process. In both States, DVRPC coordinates with its safety partners to conduct data analysis and select project locations for example, for Road Safety Audits and the Congestion and Crash Site Analysis Program. Conduct road safety audits (RSAs). Working with county and State partners, DVRPC staff manage and coordinate the RSA process. DVRPC prepares materials, invites participants, and coordinates the site visit. Invitees typically include representatives from the State, county, and municipality(s), as well as the transit and biking communities. Local roadway maintenance staff are also encouraged to attend and assist with identifying quick, low-cost solutions. Create a regional safety task force. In 2005, DVRPC established a multimodal and multidisciplinary task force that meets quarterly. The group's primary goal is “to build and maintain effective partnerships with the purpose of reducing the number of crashes and the resultant casualties in the region.” The meetings provide opportunities to educate stakeholders on SHSP emphasis areas and other safety topics. 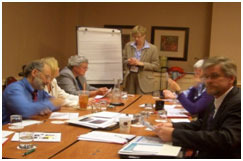 The task force guided the development of the 2009 Regional Safety Action Plan, which identified regional safety emphasis areas, and is coordinated with the SHSPs in both Pennsylvania and New Jersey. The Plan drew upon a technical memorandum, “Traffic Crash Analysis of the Delaware Valley.” In addition, Emphasis Area summary cards were prepared to educate busy elected officials: each includes a definition of the emphasis area as well as recommended strategies to reduce crashes. Ensure that safety is considered throughout all steps of the planning process. DVRPC staff work to ensure that safety is a consideration in all aspects of planning and programming, including the long-range plan, management systems, corridor studies, maintenance, funding decisions, and project implementation. Promote education and outreach. Communicating with partners is a significant focus of DVRPC's safety program. For example, DVRPC uses its website to provide information and resources to stakeholders responsible for implementing safety recommendations, such as local municipal and county governments and law enforcement agencies. Convening groups such as the Regional Safety Task Force is also an effective way to keep stakeholders informed. Next steps in DVRPC's program include continuing legislative safety symposium efforts and educating the State and local judiciary about the safety implications of waiving or plea bargaining moving violations. Addressing distracted driving with engineering and education programs. Following the peer question-and-answer session, participants discussed the role of New York’s MPOs in safety planning for the local HSIP process in two breakout sessions. Participants were divided into three working groups that discussed working with NYSDOT and local agencies, incorporating safety into long-range plans, using crash data for safety planning, conducting road safety assessments, and tracking progress in safety. Planning worksheets were supplied for groups to document their work and a facilitator moderated the session. Develop performance measures to track progress in safety. For example, one suggested performance measure was the number of sites evaluated by MPOs. Increase involvement with NYSDOT regional offices. NYSDOT regional offices are an important resource for MPOs because their staff are in the field and understand regional issues. Collaboration with NYSDOT regional offices could occur through road safety assessments and participation in joint staff meetings. NYSDOT headquarters should assess how staff are involved in updates of the statewide plan and increase regional participation to ensure consideration of local issues. Collaboration with NYSDOT on PIL reviews is another way for MPOs to contribute to the HSIP process. Develop a guidance document for HSIP projects. MPOs need assistance in understanding the application process for HSIP projects. A guidance document that includes examples of effective projects, such as programmatic improvements, would assist MPO staff in this process. NYSDOT has identified the need for collaboration to help MPOs and local governments develop a systematic process for local roads. The SWG can work with NYSDOT to move this effort forward. Ensure that long-range plans and the MPO planning process meet minimum standards. The SWG should work with the FHWA Division Office to create a template and matrix to guide MPOs on what safety issues should be incorporated in the long-range plan. Unified Planning Working Programs and Transportation Improvement Programs should also be considered as part of this effort. This would help achieve consistency between regions. Educate law enforcement on the importance of accurate data. MORPC's educational video could be used to address communication challenges between New York's law enforcement officers and planners or engineers. Since the video is currently available, this action could occur immediately, such as at New York's upcoming highway safety conference. Use all available data resources. Data from Emergency Management Services and the Department of Motor Vehicles are examples of resources that could support a more comprehensive approach to monitoring safety on local roads. Access to and use of the State's Accident Location Information System is a challenge that might be addressed through training or increased collaboration between MPOs and NYSDOT. A consistent process for using local crash data, traffic counts, and pedestrian and bicycle crash data will help MPOs develop local HSIP projects. Improve outreach and collaboration with all safety stakeholders. Peers emphasized that program success relies on outreach to all safety stakeholders through websites, webinars, task forces, committees, and other venues. For example, the SWG hosts a monthly teleconference to share information and advance safety planning initiatives. Identifying key stakeholders and champions will help ensure that the right people are engaged. Increased participation in the Association of Traffic Safety Boards was suggested as an effective way for MPOs to work with county governments. Collaboration with bicycle/pedestrian stakeholders at the State and regional level is critical to ensure that bicycle and pedestrian issues are incorporated into safety plans and projects. Develop performance measures to track progress. The SWG should coordinate with MPOs to develop performance measures that can help track and assess success for the local HSIP Program. Ensure that the analysis tools utilized for the HSIP Program can also be applied to non-HSIP local safety issues. The NYSMPOs work very closely with their member communities on a wide variety of safety issues. The MPOs will continue to work with their local safety partners on a wide range of issues that may not be applicable for HSIP funds. The analysis tools developed for HSIP should be flexible enough to allow additional work by MPOs and their members and safety partners on local safety issues. The peer exchange accomplished the SWG's goal to engage New York's safety stakeholders and identify potential action items for its Comprehensive Safety Monitoring and Planning effort. Participants learned how MORPC and DVRPC are partnering with their State DOTs and using a variety of strategies, tools, and programs to address safety on local roads. LA DOTD provided an effective model of a State that has successfully worked with MPOs to address safety on all roadways. MPOs benefit from working with local safety stakeholders and the State DOT to champion local safety planning efforts. The NYSMPO's SWG recognized that the lack of guidance for a uniform approach to the HSIP process on local roadways was limiting MPOs' success to develop and implement safety projects. The peer exchange helped identify the issues that need to be addressed to create a process that results in improved safety on all NYS roadways. Elements of this process include sharing data, developing a consistent approach to analysis and prioritization, and coordinating efforts with all safety partners. MPOs require assistance from the State DOT safety partners to make data-driven decisions required for the HSIP process. Use of crash analysis tools provided by the State DOT can help develop successful local road projects. For example, LA DOTD allows MPOs and local governments to access its internal crash query program and provides assistance with data analysis. Crash data need to be accurate and accessible to provide the foundation for prioritizing safety issues and improvement efforts. . The peer presentations showed how data can be used to identify cost-effective projects. NYSDOT's current crash database is focused primarily on the State system. For MPOs to make data-driven decisions as required by HSIP, the system needs to be expanded to include all public roadways (currently in progress). Furthermore, law enforcement needs to understand the importance of accuracy in crash reporting. State DOT regional offices can provide an effective link between MPOs and headquarters. NYSDOT does not have adequate staff at headquarters to provide the level of coordination needed for local HSIP implementation statewide. Regional offices can help to support headquarters' work. These offices are an important resource because they understand local issues and operations and can provide assistance to MPOs and local governments, such as identifying locations for systematic improvements. Outreach to safety partners in the four “E's” is important to obtain buy-in and participation on critical elements of the program. All safety agencies in New York can contribute to the safety process; however, it is important to engage partners through a variety of methods, such as websites, training, presentations, RSAs, and regional safety summits. Overall, New York's experience with developing and hosting a peer exchange was positive. Sandra Misiewicz, the chair of the SWG, felt that the “approaches of the two MPOs and the State DOT peers were impressive and very informative for us here in New York. The whole approach of having such a focused event...is extremely helpful and should be a model for other subjects.” Feedback from participants obtained after the event consistently indicated the significant value of networking and learning from peers in other States. 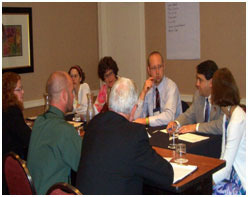 To improve the event, participants suggested that the breakout sessions could be more focused and include fewer topics. One attendee noted that “the afternoon sessions had too much ground to cover in such a short period.” However, since the peer exchange was part of a bigger conference, the time allocated to this session was restricted. Address questions regarding NY's HSIP Program. Engaging MPOs in the safety planning process from a state perspective. Improving crash data for safety planning. Developing a safety program to meet the needs of different sizes and types of local agencies. Opportunity for attendees to ask questions and get feedback from the peers. Group will discuss HSIP Program in New York including strengths, weaknesses and opportunities. Group will then initiate development of an action plan framework to enhance NY's Highway Safety Improvement Program process.